This industrial instrument non-destructively tests aircraft wires in place for insulation ageing monitoring. It combines precise loading profiles and linear measurement. 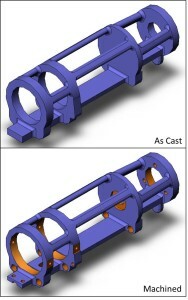 To achieve repeatability and stability required, significant design went into the underlying structure to minimize the package size and weight, while maintaining a ridged structure. 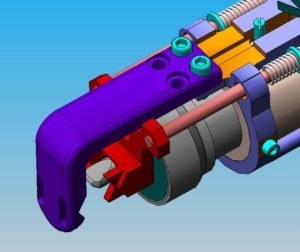 The rigid skeleton frame was designed on SolidWorks, and underwent several iterations of Finite Element Analysis to ensure deformation under load that was aligned with the major axis without appreciable bending in critical zones. A master of the framework was produced using stereo lithography (SLA) 3D printing. This then was used to produce an investment-cast part in stainless steel. 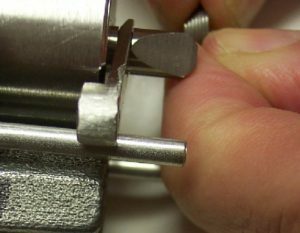 The critical mounting and indexing surfaces were then machined relative to one another with tolerances in the range of 1/10,000-inch. The exterior package also was built using SLA technology. 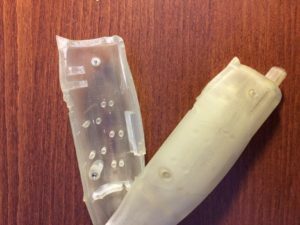 Functional prototypes were built using high-strength SLA material. A dozen field devices were fabricated using a new SLA model as a master in a urethane casting process. The final devices were indistinguishable from any other mass-production device. To date then Indenter Polymer Aging Monitor has been used in several FAA and industry non-destructive test programs.